GRAVENHURST — The Rotary Club of Gravenhurst was graced by the presence of the town’s college and university students home for the holidays. 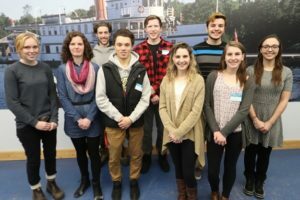 Over 30 students received support from the Rotary Bursary Endowment Fund for the 2017-2018 term. Many college students could not attend due to the extension of their term, resulting from a strike affecting all colleges in Ontario. This year the club provided $95,000 to students bringing the club’s total contributions to students from public or Catholic schools in search of a post-secondary degree, diploma or certificate to over $310,000 in the past six years. The luncheon provided an opportunity for donors to the bursary fund to meet those student benefiting from their generosity and the opportunity for students to thank the donors for their gift. Students in the photo above include Mary Vinson-Shea at Georgian College studying development services, Rachel Tilson at Lakehead University in applied life sciences, Nathanial Delarosbil at Georgian in nursing, Nicole Brandt at University of Ontario Institute of Technology in commerce, Lianne Brandt at Trent University in psychology and French, Sarah Ratchford at Trent-Queen’s University in education, Andrew Atken at Ontario College of Art in sculpture and installation, Ryan Godfrey at University of British Columbia in engineering and Nick Sluyk at the University of York in theatre arts. Ken Little, chair of the fund, noted that all last-minute donations are eligible for a tax receipt for your 2017 income tax filing. Rotary Club of Gravenhurst, Box 888, Gravenhurst, Ont., P1P 1V2.